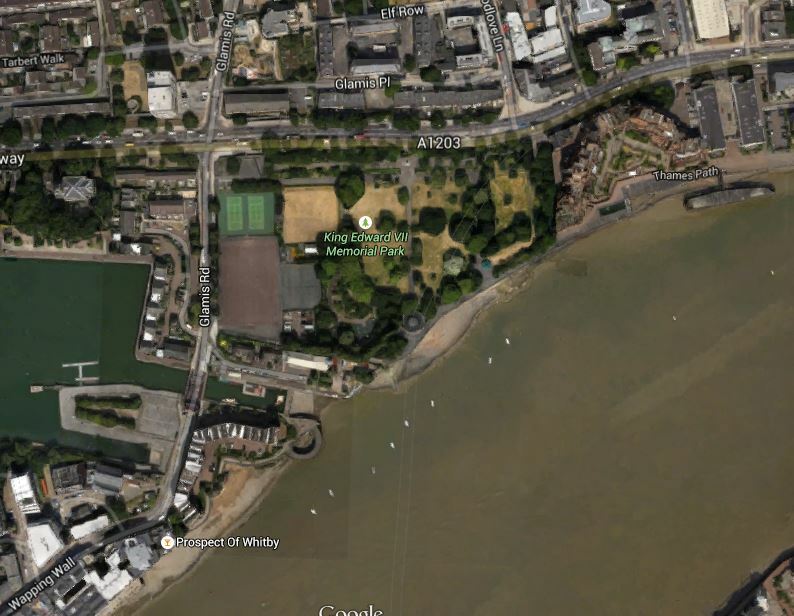 King Edward Memorial Park Foreshore is a site on the river at Wapping just to the East of a prominent Rotherhithe Tunnel Ventilation Shaft and will be on the main Thames Tideway Tunnel. On the Thames Tideway Tunnel web site, this is said. This site will be used to intercept the existing local combined sewer overflow, known as the North East Storm Relief Combined Sewer Overflow. This is a Google Earth image of the area. 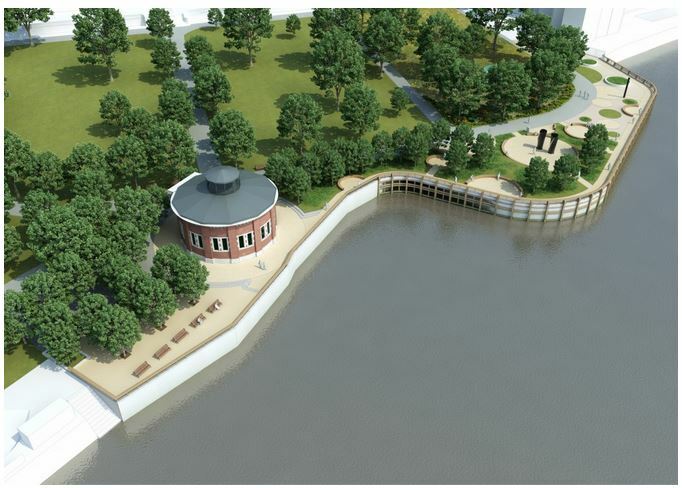 Note the circular shape of the tunnel ventilator, which is just back from the foreshore in the middle of the park. This image shows a visualisation of what the finished site could look like. It is rather a quality urban park and given the location and the increase in size, when the works are complete, I suspect that any good managers could make more than a fist of this contract. You don’t see many lift bridges these days and until a few days ago, I hadn’t realised that this one was there on the Greenwich Rail Line over Deptford Creek. This report in East London Lines gives details on the current state of the bridge. This is an extract. The bridge has not been used in several decades and the lifting section was welded shut into ‘down’ position over 10 years ago. Locally the bridge is a popular sight as well a visual reminder of Deptford’s industrial heritage. The rumours did not go down well with some residents. The rumours were about demolishing the bridge. 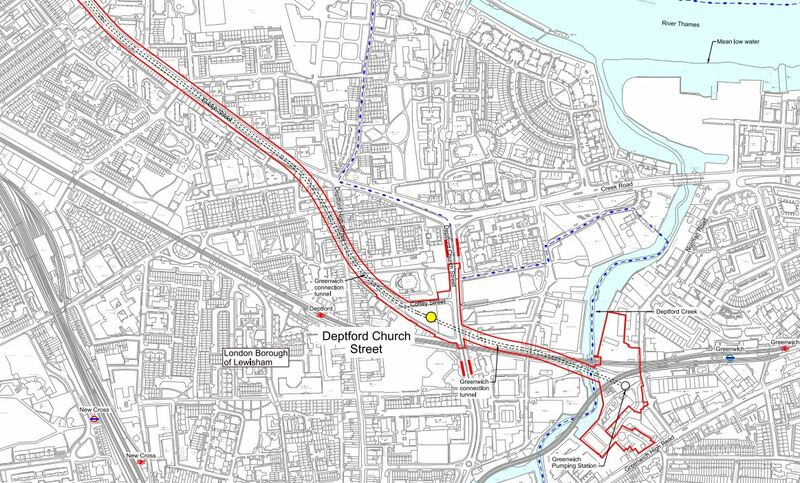 According to Wikipedia this area was the site of the Battle of Deptford Bridge, which was the last battle of the Cornish Rebellion of 1497. I’d never seen the DLR to Lewisham from the outside, so when I travelled it this morning, I took some pictures, as I walked around the viaduct. In my view it is a classic concrete viaduct, that has been used to slot the Docklands Light Railway between the two stations.